BANJUL, Gambia — President Yahya Jammeh once predicted that his rule could last a billion years. Now, the fate of his nation is hanging on one more anxiety-filled day. After acknowledging defeat in an election last month, Mr. Jammeh abruptly changed his mind, refusing to step aside for the inauguration of the new president scheduled for Thursday and threatening to drag the nation into a bloody standoff. West African nations are preparing to enter the country and force Mr. Jammeh’s ouster if he does not leave. In response, Mr. Jammeh has threatened that his own military is prepared to defend Gambia’s sovereignty. Senior officials in his government have resigned in protest or left the country. At least 26,000 Gambians have fled to across the border into Senegal, the United Nations says. Hundreds of tourists on beach vacations were also being evacuated. Now, his opponent in the election, Adama Barrow, who has retreated to Senegal but has the overwhelming support of Gambians and international leaders, is forging ahead with plans for an inauguration ceremony on Thursday, throwing continental Africa’s smallest nation into uncertainty. “What we are simply and rightfully asking for is to return to the polls and allow Gambians to elect who they want to be their president,” Mr. Jammeh told the nation, rejecting the previous vote as riddled with irregularities. Parliament added to the confusion on Wednesday, voting to extend Mr. Jammeh’s term for three months, state television reported, although it was not clear whether the move was binding. Dueling claims to the presidency have upended nations in the region before, coming to a violent end in Ivory Coast in 2010. Back then, Laurent Gbagbo, the president, refused to step down after the challenger, Alassane Ouattara, won a presidential election. Mr. Gbagbo declined to vacate the presidential palace, while Mr. Ouattara was forced to hide in a hotel with United Nations peacekeepers watching over him. The standoff led to months of turmoil and the deaths of more than 3,000 people as armed groups swept across the country and battled for control. Finally, France, the former colonial power, attacked Mr. Gbagbo’s compound and helped drive him out, culminating in his arrest in April 2011. Many Gambians are worried about a repeat in their country. Samsudeen Sarr, Gambia’s deputy ambassador to the United Nations, predicted that military intervention in Gambia would lead to a similar civil war if foreign forces intervened. At first, Gambia seemed on track for a surprisingly simple transition. 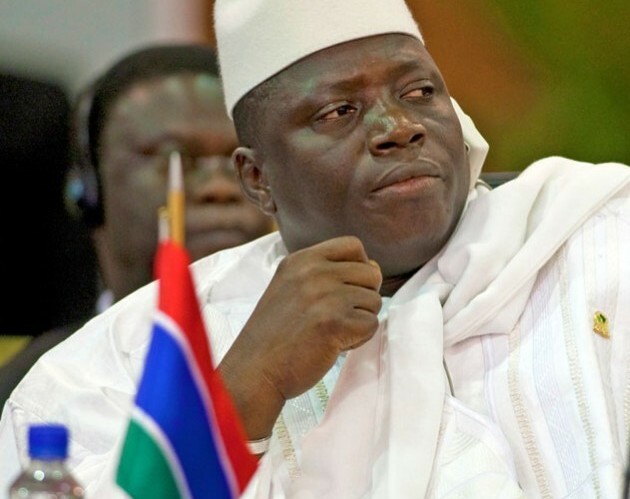 Mr. Jammeh has stiffly ruled the nation for 22 years since seizing power in a coup. His government has prosecuted and imprisoned critics, some of whom wound up dead. Thousands of citizens have fled the country amid soaring unemployment. Threats of imprisonment have been a fact of life for years. Without warning, the country cut off telephone and internet service around the time of the election, raising fears of government repression to hold on to power. But after election results showed that Mr. Jammeh had lost, he suddenly conceded in a polite, jokey phone call to Mr. Barrow. Gambians erupted with relief that his rule was over. Behind the scenes, Mr. Jammeh was fuming over the results. His advisers eventually persuaded him to concede to avoid unrest. Then talk of his prosecution for human rights abuses began. Mr. Jammeh announced that the vote was flawed and appealed to the Supreme Court. Since then, Gambia’s election drama has unfolded with strange twists. Regional leaders flew in but failed to persuade Mr. Jammeh to accept the vote. A hashtag circulated on social media — #GambiaHasDecided — with citizens calling for him to step down. The court effort stalled, largely because Gambia has not had a full panel of Supreme Court judges in more than a year, after Mr. Jammeh fired justices and refused to refill the bench. A court hearing on the case was recently rescheduled, but not until May, potentially leaving the fate of the country uncertain for months. Mr. Jammeh called Liberia’s president, Ellen Johnson Sirleaf, who is also the chairwoman of the Economic Community of West African States, appealing for help in assembling a panel of Supreme Court justices to hear his case immediately. Mr. Jammeh broadcast the phone call to the nation, unbeknown to Ms. Sirleaf, who apparently thought the conversation was private. Mr. Jammeh’s cabinet is showing cracks. His information minister, who for years had staunchly defended him, fled the country. This week the minister of finance resigned, and a day later his replacement also resigned. The minister of tourism and the health and social welfare minister have also quit. Mr. Jammeh has fired others who have called on him to respect the election results. Sheikh Omar Faye, Gambia’s ambassador to the United States, was called back from his duties after publicly appealing to Mr. Jammeh to step down. Mr. Faye said it was morally difficult for him to remain silent while Gambians were in a state of uncertainty. Alhaji Moamar Njai, the chairman of the Independent Electoral Commission, also fled the country, citing fears for his safety. Joining them are tens of thousands of citizens who have run to the countryside or poured across the border in fear of bloodshed. Even the election winner, Mr. Barrow, has left the country. Last week, he flew to Mali to meet with other regional leaders who pledged their support. For now, he is in Senegal, planning his inauguration ceremony and avoiding security risks that might emerge in Gambia. Over the weekend, his 7-year-old son back home died of a wound from a dog bite. The funeral took place without Mr. Barrow, who had been advised to stay in Senegal for his safety. In recent days in Banjul, the capital, shops in the main markets have stayed closed out of fear. Food prices have shot up, tripling in some areas. Gambia’s intelligence officers have arrested several opposition sympathizers and have shuttered three independent radio stations. At least six people have been detained for wearing or selling T-shirts bearing the #GambiaHasDecided logo, according to Amnesty International. The huge presence of security forces across the city is making everyone uneasy. Amy Sakho, a resident of Serekunda, said she went out on Monday to buy a Barrow T-shirt for inauguration day but backpedaled when she saw the police on the streets. Jaime Yaya Barry reported from Banjul, and Dionne Searcey from Dakar, Senegal.